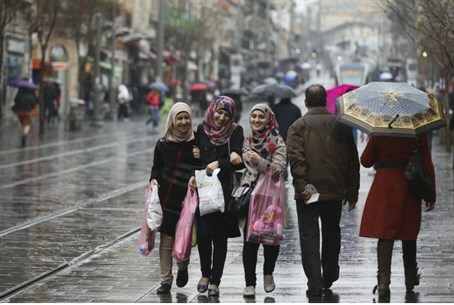 World Economic Forum poll puts Israel way ahead of its Muslim neighbors in terms of women's basic rights and freedoms. Israel is the best country in the Middle East for women's rights and freedoms, the World Economic Forum's Global Gender Gap survey concluded this week. The survey, which has been conducted since 2006, ranks 110 countries in terms of gender equality and inequality, using a variety of factors including demographic data, socioeconomic figures, and a close look at women in the legal system. In 2013, Israel ranked #53 for women's rights worldwide - up two places since 2012 - but top for the Middle East overall. Middle Eastern and Muslim countries ranked lower on the list, possibly due to their lower human rights records overall. Thomson-Reuters noted recently that several Middle Eastern countries - Egypt, Iraq, Saudi Arabia, and others - have a poor track record for violence against women, reproductive rights, as well as the treatment and role of women. Egypt bottomed out the list. The report noted that the Comoros Islands have the best track record for treatment of women in the Arab world; while the tiny nation did not appear on the WEF list, Oman - which ranked second for the Arab world in the Reuters poll - ranked 122nd in this week's survey. Kuwait, which ranked third on the Reuters list, stands at just 118. The survey's results were published in honor of International Women's Day, which was on March 8, and surfaces within days of reports that the Saudi Arabian royal family has been holding princesses captive against their will for several years. Israel received the Reducing the Gender Gap prize in 2013 from the European Parliament for its efforts in championing women's rights.